Cleansing Trio Natural Detox Kit contains essential oils and herbal cleansing ingredients. This kit provides three natural liver and colon cleansing supplements that support a healthy digestive system and healthy liver function. ICP keeps your colon clean with an advanced mix of fibers that may cleanse out residues. 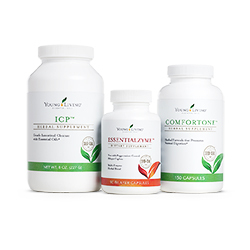 ComforTone eliminates residues from the colon thereby enhancing its natural ability to function optimally. It strengthens the digestive system by providing nutritional support and supporting normal peristalsis. Also contains Essentialzyme enzyme supplement. Enzymes that support a healthy digestive system. Enzymes in the body help to remove waste from the cell during this process so that the body is able to eliminate toxicity in a healthy manner. Providing additional enzymes in the body will support the healthy function of the cells in order to do this. This is an easy reference guide for Cleansing Trio all natural detox kit. It will tell you how to use it and what to use it for! Want to Purchase Cleansing Trio Natural Detox Kit? What is in the Cleansing Trio Bundle? What are the Documeted Uses for Cleansing Trio Supplement? Absorption of nutrients, detoxification, support of healthy digestion function and normal peristalsis. Can this product be used for Animals? Yes, put please refer to the individual supplements for more information. Want to Purchase Cleansing Trio Detox Bundle?